Here’s a surprising fact: 90% of all the data in the world today was created in the last two years. Think of that: We now have 9 times more data than we had in 2016. Change is accelerating, and it is creating untold opportunities and risks for thousands of our customers around the globe. That’s why we knew we had to transform our company to refocus and enhance our capabilities to help our customers succeed in their own transformations. The explosive growth of data is changing how organizations operate and compete in the new digital era. They must make challenging decisions to adapt or they’ll be left behind. And adapting can be very tough. We know firsthand – We formed a new company! Hitachi Vantara takes the lead in integrating Hitachi’s expertise in information technology (IT) and operational technology (OT). A multibillion-dollar Hitachi Group company, we are building a new future for the company in the era of data and the internet of things (IoT). Our main principle is to structure our company and our mindsets around our customers–to become unwaveringly customer-centric. We have re-formed as a data intelligence company and innovation partner to our customers to help them discover and fully exploit the value in their data. Simply, that is why Hitachi Vantara exists. I want to give you a look inside our transformation and how we help our customers succeed now more than ever. All of us at Hitachi Vantara have a unique view of the changes in the world’s organizations. Data is the change agent because progressive companies use it to improve their customers’ experiences. We’ve been helping thousands of organizations modernize their data infrastructures to achieve that goal. Fewer than 10 years ago we saw that the broad connections among the world’s people and businesses were generating data everywhere and new organizations were forming to take advantage of the data. Recently, we worked with India’s State of Andhra Pradesh, a People’s Choice winner in the Hitachi Transformation Awards just last September. They had several massive challenges and an equally big opportunity to transform the lives of their people. Government leaders wanted to use the wealth of data within their borders to improve public services, government operations and public safety through a data-driven situational awareness that included government programs, emergency response and even local weather that might affect farmers. Their obstacles were daunting: 13 districts, each with its own data systems and analytics, and 33 state departments, each with many data silos. They call it their Real Time Governance initiative. We set them up to analyze big data sets gathered from throughout the state to make insightful decisions that dramatically transform citizen services. Keeping its citizens at the heart, Real Time Governance is set to revolutionize governance in Andhra Pradesh for a safer, more efficient and sustainable society. It’s part of a global shift in how real-time, continuous access to information and data reshapes regions and industries. But even with all these changes, our customers know they need to manage their data better and find the value in it – their return on data. Data has the power to unlock tremendous innovation. We help them store, protect, enrich, activate and monetize their data with our uniquely designed “data stairway” to value. We use machine learning and artificial intelligence, operating on premise, in the cloud and as a service. We work with our customers to find and implement the strategies for using data that are the difference between finding growth and courting extinction. As I mentioned, we learn a great deal from our customers. Last year, we saw an opportunity to begin transforming our own business to build and deliver the solutions that help our customers the most. We already had a huge portfolio of innovation, development and experience from across Hitachi. And we had three operating groups with recognized solutions for using data to reach outcomes for enterprises in commercial, industrial and public-sector markets. By forming Hitachi Vantara, we integrated our capabilities and streamlined our own business to build the most responsive technologies, systems and services. Added more than 1,000 new customers to an impressive roster that already included 85% of the Fortune Global 100. Continued to cultivate world-class talent across Hitachi Vantara, adding 1,400 talented professionals from other market-leading companies. Added nearly 20 new or enhanced products and solutions to our portfolio. Strengthened our ecosystem by adding new cloud, data analytics and IoT partners, and expanded existing relationships to support digital transformation across the globe. Received significant industry recognition by industry analysts and influencers. Acquired REAN Cloud to reinforce our ability to accelerate and secure enterprise cloud adoption across multicloud environments. Of course, transforming a multibillion-dollar company presents us with many options, some of which are vital to success and many of which are mere distractions. We adopted a simple and powerful framework (see the graphic, below) for prioritizing our work. At the top we have our strategy that focuses all the important work to ensure that we continually help our customers unlock the power in their data. This strategy shapes our business model, which manages our operating model, the design of our organization and our needed capabilities. At the bottom of the framework we align our technologies to support the whole business. What are our winning aspirations for our solution and platform offerings? Where will we choose to compete and how will we win? What capabilities do we need? Which ones are the new ones that we must design? Which are existing capabilities that we must refine? How should we configure our capabilities? Who owns them and has decision authority? What business processes, technology and management systems do we require? 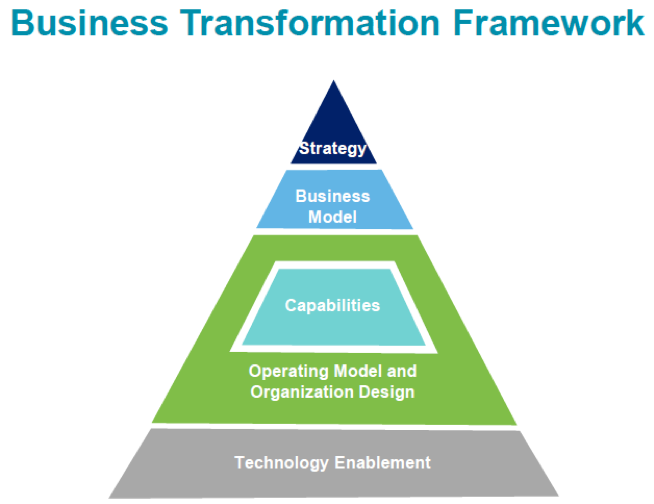 With our integrated transformation framework, we manage the breadth of choices from strategy to technology enablement, illustrated in this model created by Deloitte. 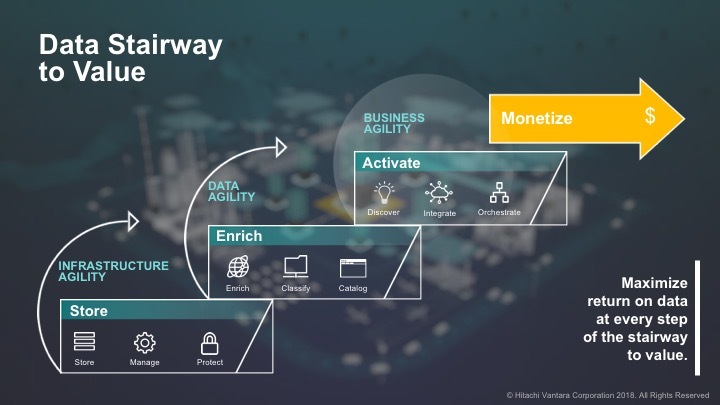 Through our framework and associated processes–not to mention our intention and urgency–Hitachi Vantara will capitalize on Hitachi’s experience by bringing together operational technologies (OT) and our own information technologies (IT) and capabilities to develop new data-driven offerings. The transformation of Hitachi Vantara is strong and ongoing as we keep pace with our customers’ own transformations. In the coming months, I’ll tell you more about own journey of transformation.